On Thursday, September 21st, HDC’s Harmony Club competed against other expert chili makers at the annual Head of the Lakes United Way “Chili by the Lake” Chili Cook-Off fundraiser. 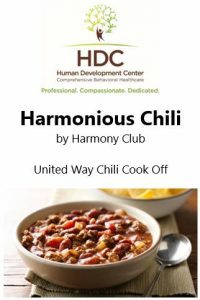 Their “Harmonious Chili” took Second Place against all the competitors in this awesome event. Help us congratulate them – It was delicious!